Hello, all. Hope you are cuddled up and warm with how cold it’s been! Last Thursday night, Dana informed me that Tyja (Applewood Chef!) wanted to either have dinner at home or go out to eat with friends. I asked Tyja and Sarah about going out to a restaurant I hadn’t reviewed for the blog yet, and they agreed. I suggested Sazón, a Peruvian restaurant in Santa Rosa, and everyone was in favor of the idea! Dana, George, Sarah, Tyja, and I all went out for a fabulous dinner. I had never eaten at a Peruvian restaurant before, so I had no idea what to expect. I learned quite a bit at dinner there and I will share it all with you! You can read all about Peruvian cuisine on Wikipedia. Does it all look so delicious or what? Fried Corn – Complimentary. I couldn’t stop eating these! Imagine Corn Nuts without the salty-processed flavor and instead a freshly-fried flavor! Plátano Frito Macho – We agreed that plantains were a must for a Peruvian dinner, so we ordered some crispy plantain chips to share. These are not the sweet plantains; they were more savory than anything. And they were crispy and tasty! Camote Frito – In addition to plantains, we felt that sweet potato chips would be great to snack on until we received our meal. The chips came with huacatay. The chips were sweet and crispy, but what really helped everything together was the huacatay! Plátanos Fritos Maduros – Fried sweet plantains? Yes please. 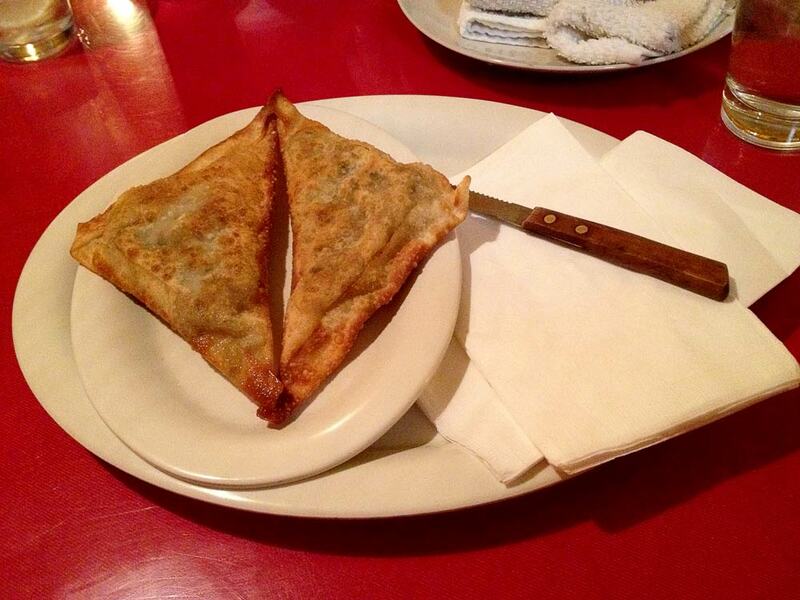 This was something we had to try, especially dipped in sour cream and eaten with the salsa Criolla. I want to go back to Sazón to order this! Anticucho de Corazón – Sarah had been to Sazón before and highly recommended the beef heart, which sounded good to me! This is the first time I’ve had beef heart, and it won’t be the last! The heart was cooked and seasoned perfectly, and was surprisingly tender. Order it if you get a chance to eat at Sazón. Ceviche de Pescado Clásico – Sarah and Tyja decided on this ceviche, featuring tilapia in a fantastic citrus sauce. This was another item that I want to eat again soon. The sauce was so incredibly tasty that we had it put in a glass to eat plain! Ahi Ceviche Nikei – Well, I couldn’t resist the raw ahi tuna, especially since it came with sesame oil and avocado, so I insisted on ordering it. Served with wonton chips, this is a dish I would recommend to anyone who enjoys raw tuna. It tasted so fresh and light! I thought the ingredients were a bit strange, and Sarah explained to me that Peruvian food has a lot of Asian influences! Lomo Saltado – Tyja ordered a steak tenderloin dish that I didn’t get to taste, but it looked just beautiful and I probably would have loved it had I tried it! Veggie Saltado – Dana ordered a vegetarian dish that also looked and tasted great. The balsamic soy sauce is something I never would have thought of! 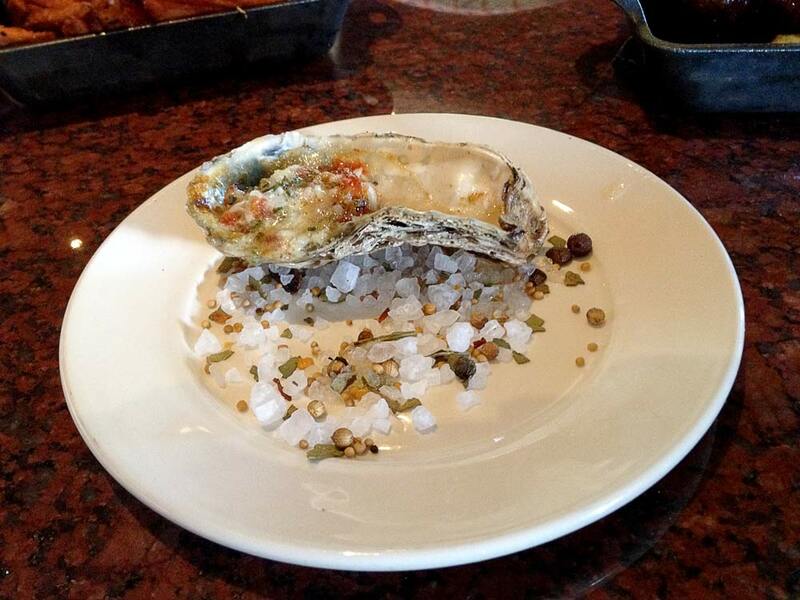 It was salty sour… mmm, mmm, mmm. Pescado Frito – George ordered a fish dish, which I tasted, and it was seasoned perfectly! I definitely recommend this dish if you love fried fish. Ensalada Bistec – Sarah ordered a salad that included a sautéed steak tenderloin with mixed greens and avocado and a creamy cilantro dressing. How refreshing! A perfect amount of steak with a bunch of veggies. And the steak was delicious! Alfajores – This is a Peruvian sugar cookie filled with dulce de leche. As soon as I saw “dulce de leche” on the menu, I knew that’s what I would have. Best decision ever. Holy cow, if you like dulce de leche, you need to try this cookie! So sweet and yummy! Tyja almost got another one! Something else worth mentioning is the white sangria. It was infused with passion fruit and was so incredible. I love tropical fruit! And I love the food at Sazón! I’m so excited to go back! Sazón has new customers. You should definitely try it out soon! Welcome back, all. I hope you enjoyed the wall of sushi from last week. This week, we’re still in Asia, food-wise. Also, I’m going to try something a little different: post a gallery of photos and then list out and describe each item we ate. The first time I tried Royal China, which was three or four years ago, I knew it was my favorite Chinese restaurant in Sonoma County. Dynasty in Rohnert Park is pretty decent, and Gary Chu’s Chinese is way up there. However, I prefer the food at Royal China. I am no Chinese food expert by any stretch of the imagination. I know about as much as the average American. To me, Chinese food is still orange chicken, chow mein, hot and sour soup, and egg rolls. All that said, I know I like good food made with love, and that is exactly what you can find at Royal China. Last Thursday night, Dana, George, and I ventured on over to Santa Rosa to return to Royal China for the first time in three years. I was excited! And for the most part, I was not let down. Unfortunately, the lighting inside Royal China was very dark, and all I use is my phone to take images. I did what I could quickly to edit them, but they are still a little grainy. Calamari Tempura – What? Tempura? Tempura isn’t Chinese! Well, one doesn’t always eat at an ethnic restaurant strictly for the authenticity. Sometimes, you’ve gotta try something that sounds good, no matter what that means. George and I looked at the menu item, looked at each other, and thought, yup, that’s the one… that’s our appetizer. (Dana didn’t really have a preference). And what a great choice it was to order it. This calamari was incredibly tender, which is unlike any other squid I’ve ever had anywhere. I think I really prefer the tempura batter to the traditional, heavy breading that is used on most fried calamari. Dipped in the sauce provided (I believe it to be plum sauce and mustard), it was perfect. This ended up being my second favorite item of the night. Fried Rice – The three of us agreed to share a plate of fried rice. I know what you’re probably thinking. How is she going to sell me on fried rice? It’s yummy, but fried rice is the same almost anywhere! Well, that’s what I thought, too, and that night I was proven wrong. I almost always enjoy fried rice, but this was particularly good. Most fried rice is pretty greasy, and I think that is what make’s Royal China’s fried rice stand out. It was not greasy at all and incredibly flavorful. If you like fried rice, definitely try Royal China’s! Glazed Walnut Prawns – George ordered the glazed walnut prawns, and I forced him to let me taste. I mean, he was nice enough to let me taste. Yes, that’s it. Anyway, this was easily the best dish I tasted all night. First of all, you can’t really go wrong with deep fried anything, but what made this such a delight to eat were all of the bold flavors. The glaze and the shrimp and the walnuts all mixed together were just the perfect blend. I wanted to eat more! Next time I visit Royal China, this will probably be what I order! Curry Vegetables with Tofu – Dana ordered this item, which was supposed to be a lot like a Thai coconut curry. I wish he had ordered something else… and so did he! This was some of the blandest curry I’ve ever tasted, aside from the fact that it was too salty! My recommendation: eat Thai curry at a Thai restaurant. Mu Shu Pork: This was my entree. While it was definitely tasty, I don’t know if I’m a diehard fan of mu shu. I’ve had it before and I don’t remember ever being in love. I would eat it again as it was delicious, but I would much rather have the walnut prawns! No dessert this week! Well, except of course the staple fortune cookies! If you like Chinese food, definitely try Royal China. It’s really good and reasonably-priced. It was a very exciting Friday as I had just gotten paid. YAY! What a better way to celebrate than have a few beers and go out to Abyssinia? 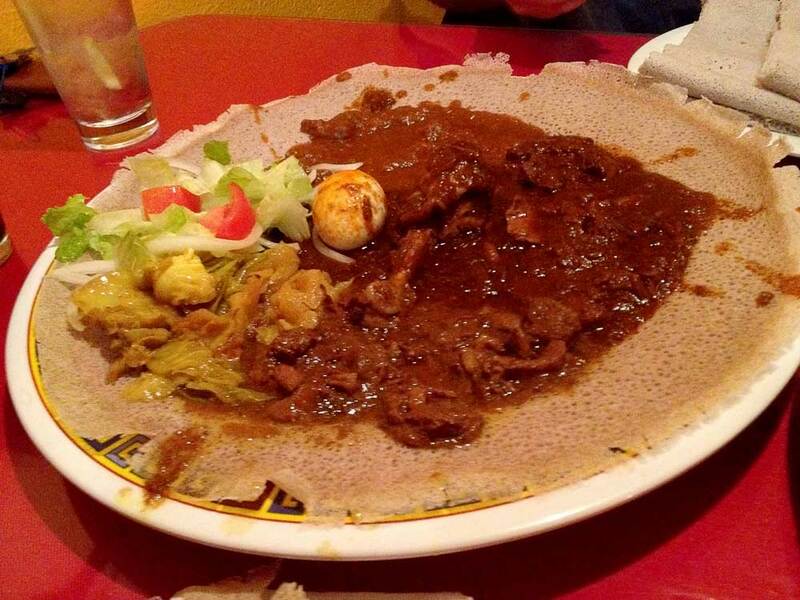 Located in Santa Rosa, Abyssinia features some great Ethiopian food–something one would only expect to find in larger cities such as San Francisco and Los Angeles. I was quite excited when I discovered Abyssinia as the first time I had Ethiopian food was in Reno, and I loved it! So two of my friends (we’ll call them George and Charles because I don’t know if they care if I use their real names and I’m too lazy to find out) joined Dana and me for a yummy dinner. This was my fourth time at Abyssinia, and I was very excited for my return! As my beverage choice, I ordered the honey wine. 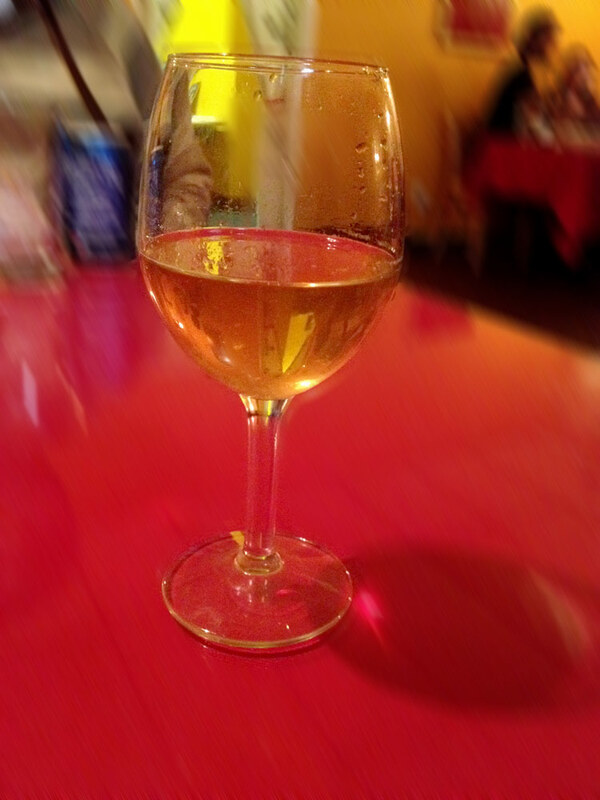 Honey wine tastes pretty much as you would expect: like fermented honey with a similar finish as grape wine or rice wine (sake). I actually really love it, which is rather surprising because it is sweet, and I much prefer dry wines and sakes. I suspect what I enjoy about it most is that it tastes like honey! Something you should know about Ethiopian food before we get to the actual food part of this entry is that it is usually served on a communal (large sharing) plate with a type of bread called injera, which is made from a grain called teff. This is my limited understanding of Ethiopian food, as people in general have a tendency to modify any ethnic food they are unfamiliar with. Anyway, back to how Ethiopian food is eaten (at least in the USA). A group of hipster foodies gather round to talk about their hipster trophies and how they were the first of their friends to eat Ethiopian food. They take turns dipping the injera into individual dishes. I insisted that we order an appetizer as this is a restaurant review blog, and I am trying to eat off of as much of the menu as I can afford and fit into my growing tummy. So, I decided on beef sambusas (because who cares what anyone else wants). It tasted a bit like a hamburger in a pastry, if you can imagine that. There were lots of spices and it tasted great, though it’s nothing that I would absolutely have to order next time. 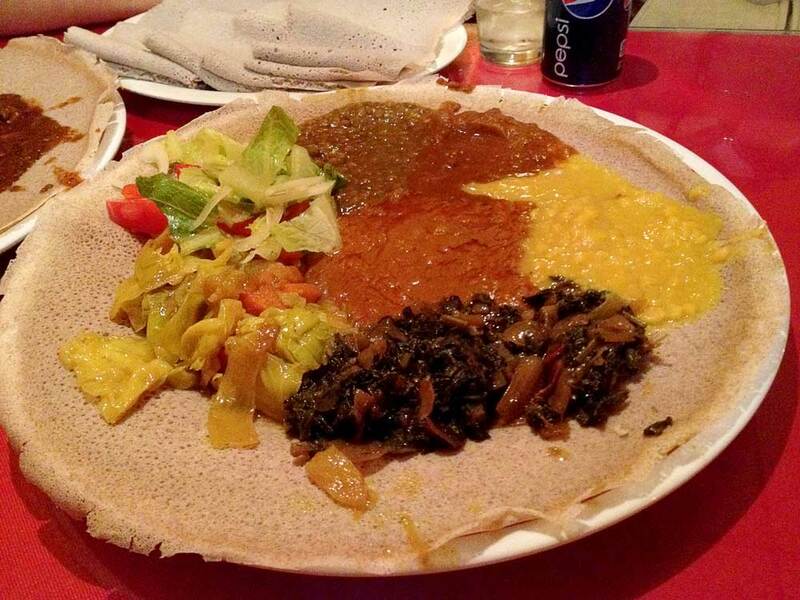 As always, we ordered a Vegetarian Combo and an Abyssinia Combo because it lets us taste a bit of everything. The Abyssinia Combo includes samples of chicken and lamb dishes while the Vegetarian Combo is made up of mostly samples of lentil and garbanzo bean-based dishes. Tikel Gomen – Cabbage, carrots, and potatoes lightly cooked with ginger. I love food with lots of spices (like curries, as I’ve mentioned before), so I enjoyed everything. My favorite item of all time there is tikel gomen (cabbage, carrot, and potato), which is a bit odd for my meat-lovin’ self. I also particularly enjoy the yabesha gomen (collard greens), and the yebeg alecha (lamb strips). Overall, I love both combos and would order them again and again. However, I think next time, I will actually order individual items instead since I am finally starting to figure out what I like most. Dana, George, and Charles (I’m cracking up at these names…) all enjoyed their food, but not as much as I did! I think Dana prefers the restaurant in Reno, but I don’t remember that meal as well as he does. After we finished the combos, we didn’t feel like sticking around at Abyssinia for dessert, so we decided to go to Screamin’ Mimi’s in Sebastopol instead. 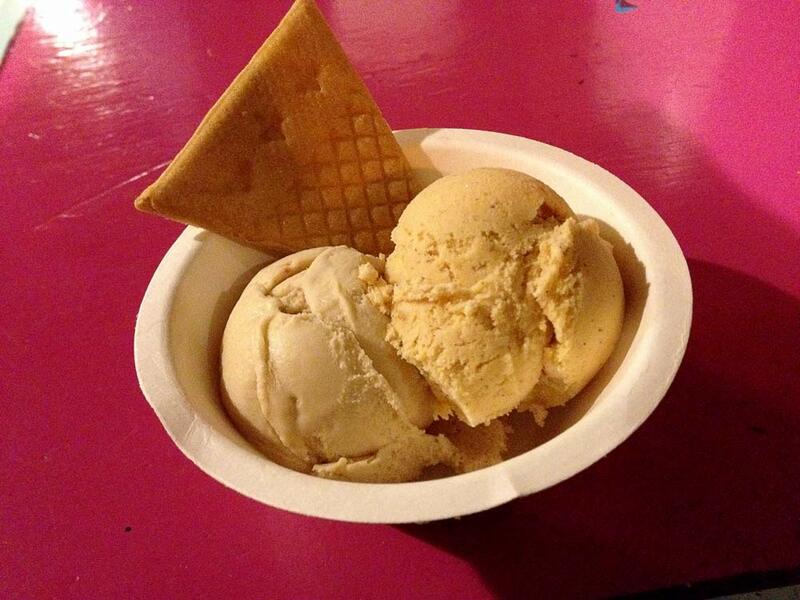 I was so excited that Mimi’s had pumpkin ice cream because I love pumpkin-flavored desserts! This ice cream tasted just like pumpkin pie, mmm mmm mmm. The hazelnut ice cream was also great, and it tasted like–you guessed it–hazelnut! It was an odd night for me since I did not have chocolate! My favorite ice cream flavor from Mimi’s is probably the Midnight Menthe (chocolate ice cream with mint), which is not there every night (for those who don’t know, Mimi’s rotates their flavors). Another big plus about Mimi’s is that all of the ice cream is homemade, and they use real sugar instead of high fructose corn syrup (I’m looking at you, Honeymoon). Please go give both Abyssinia and Screamin’ Mimi’s a shot! Today, I will be discussing an awesome restaurant in Santa Rosa called Stark’s Steakhouse. I know many people who love Stark’s, but I do not know anyone who even remotely dislikes it! In the past, I have eaten there for lunch or dinner. Some dishes worth mentioning are the prime rib, the steak tartare with smoked chili aioli, the ahi tuna tar tare, and a burger. But today I had a new experience with happy hour! This past weekend, my sister, Cindy, came to visit me and join me in my culinary adventures. We decided on trying Stark’s Steakhouse’s Happy Hour as I had heard positive reviews of it, and I know that I enjoy their dinner menu. Dana (boyfriend) joined us on the outing. My sister and I each started with a Beefeater Martini. At $2.50, it was hard to resist! I think this was actually my first martini, ever. I have had Appletinis and the like, but this was my first plain one! I did not particularly enjoy it aside from the obvious reasons. 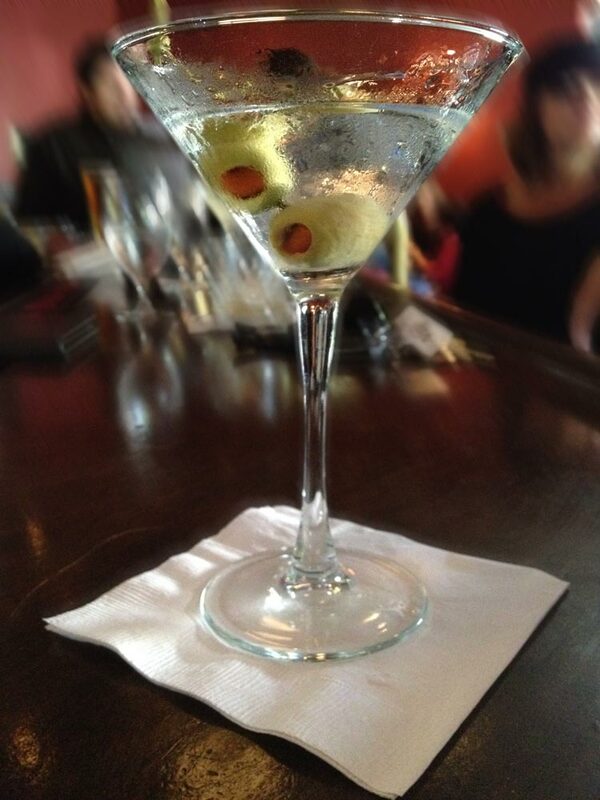 But I am not a good judge of this as I am a martini newbie! On to some food! 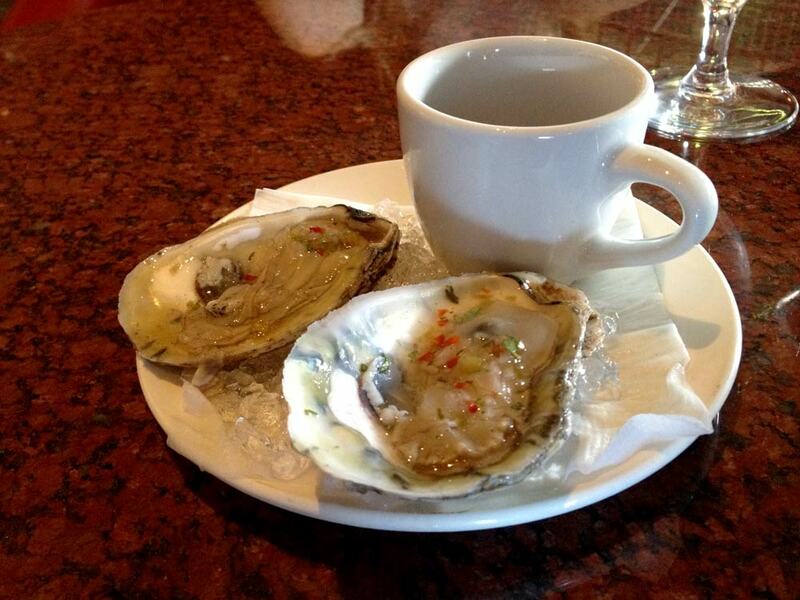 I have always loved oysters on the half shell. I am not very familiar with all of the different kinds other than knowing their names, but I know that I have never met an oyster that I did not like! My sister feels the same way about oysters, so it was an easy decision to order one oyster each. We were not disappointed! They had a nice, smooth flavor and creamy texture. I would recommend them to oyster lovers! Ah, my favorite item on the menu! My sister, Dana, and I are all raw fish lovers, so we ordered some tuna tartare tacos! If you love raw tuna, this is an item I highly recommend, especially at $1.75 a piece! 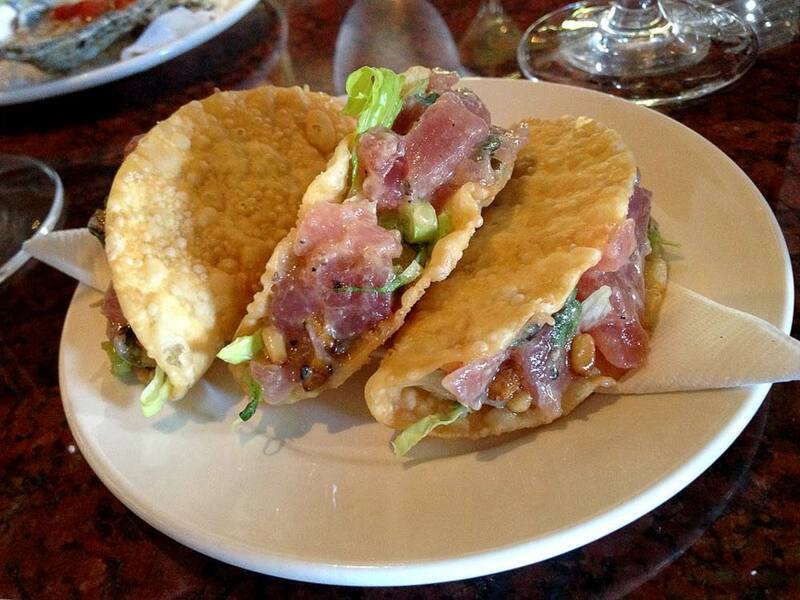 The “taco shells” are actually fried wontons, which always works well with ahi. The flavors were fabulous and the fish tasted fresh (though my experience has taught me that most “sashimi-grade” fish served in restaurants is flash-frozen at some point)! I would go to Stark’s every weekend just for this item. Dana was not particularly interested in the oysters, so he got himself a mini burger with cheddar cheese and bacon. The waiter did not ask how he wanted his burger cooked, so it came back medium, which he finds acceptable, but you guys know me and my love for raw meat! I did not get a chance to try it myself, but he said he could not really taste the cheddar and the piece of bacon was miniscule. He has had the burger from the dinner menu at Stark’s before and says it is much, much better and claims it is the best burger he has had in Sonoma County! 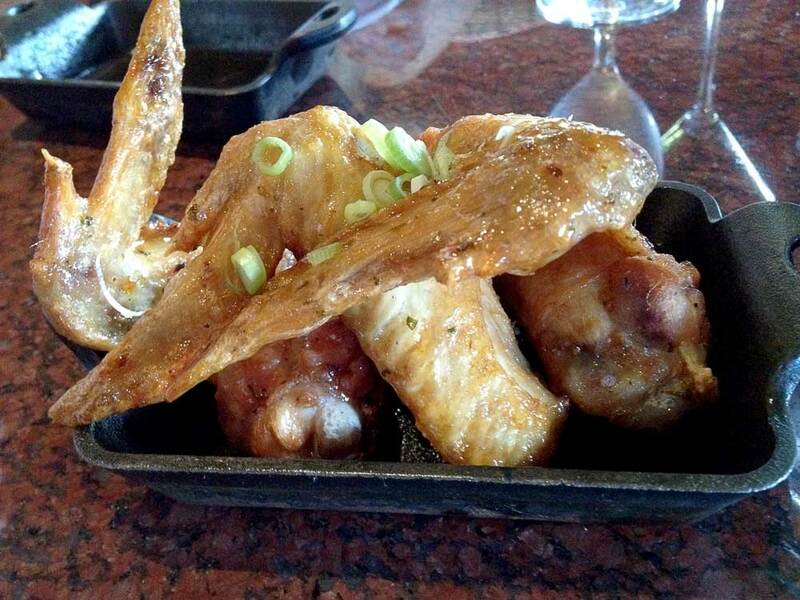 I am a sucker for chicken wings, and many people in the lounge around me were ordering these, and they looked delicious! So, we agreed to order them. The sauce on them was very tasty and the chicken was very moist. However, the meat did not have much flavor under the sauce and could have stood to be marinated longer, if at all. 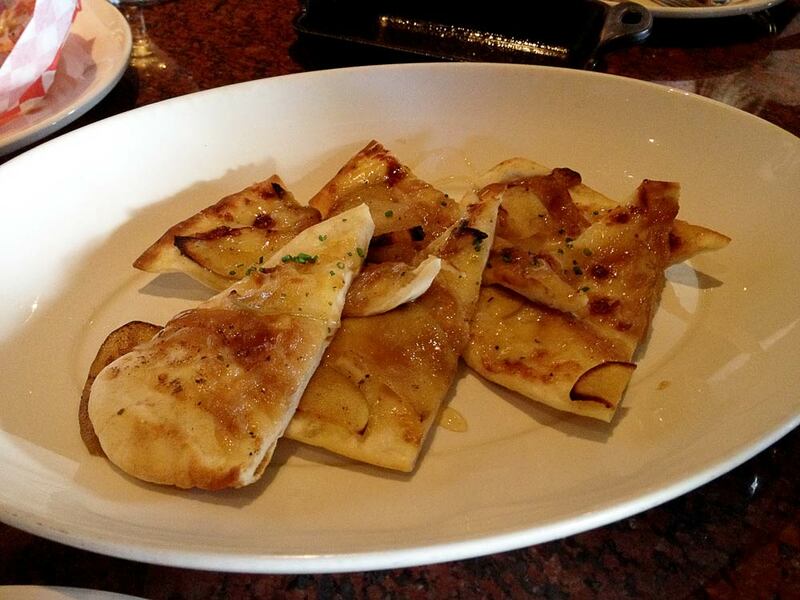 Who does not love flat bread? Crazy people! We decided to share some flat bread, and man was it tasty! There really is not much that says “wino yuppie” like cheese, fruit, and honey. And I love me some wino yuppie food! I was rather impressed with this flat bread and I would definitely order again. There was a perfect blend of flavors: sweet, savory, salty. Mmmmm. Delish. My sister loves her Vietnamese sandwiches, so she could not resist the bhan mi. I am not very familiar with them because there is no Vietnamese sandwich place in Sonoma County that I know of. Despite my lack of experience, I really enjoyed the bites I had from this sandwich. 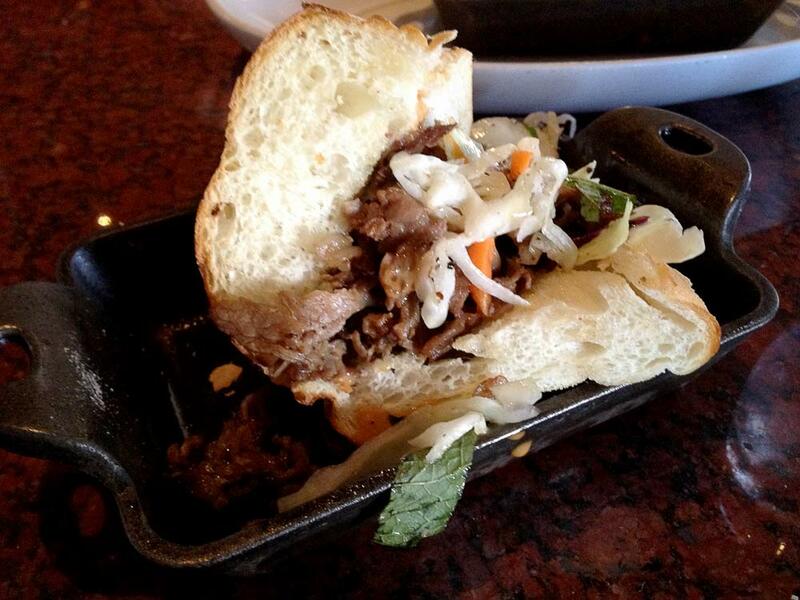 The bread tasted fresh and the beef was so flavorful! I would definitely order it again! Well, as soon as I saw “Moroccan”, I was sold. I insisted we order the chicken meatballs. 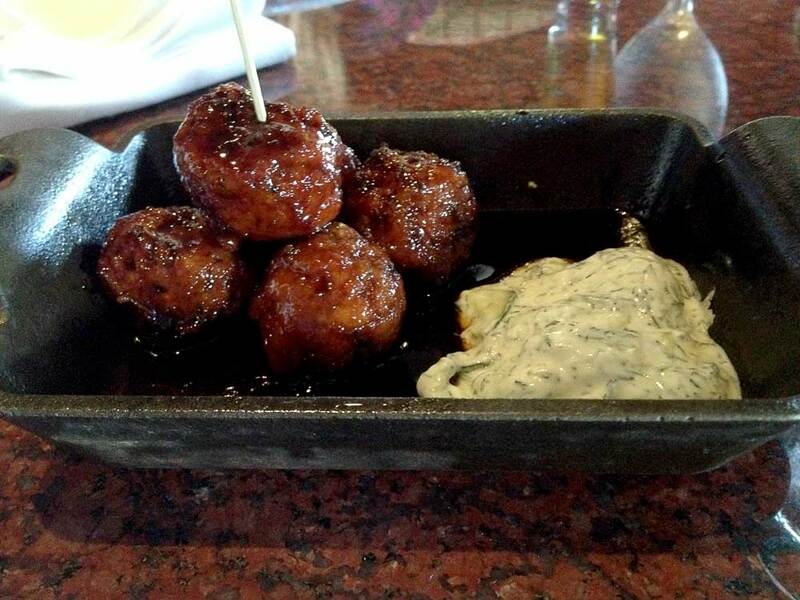 And what a great choice that was: Great spices, moist meatballs, and a great dipping sauce. If you love food with lots of spices, like curry, you need to give these a shot! 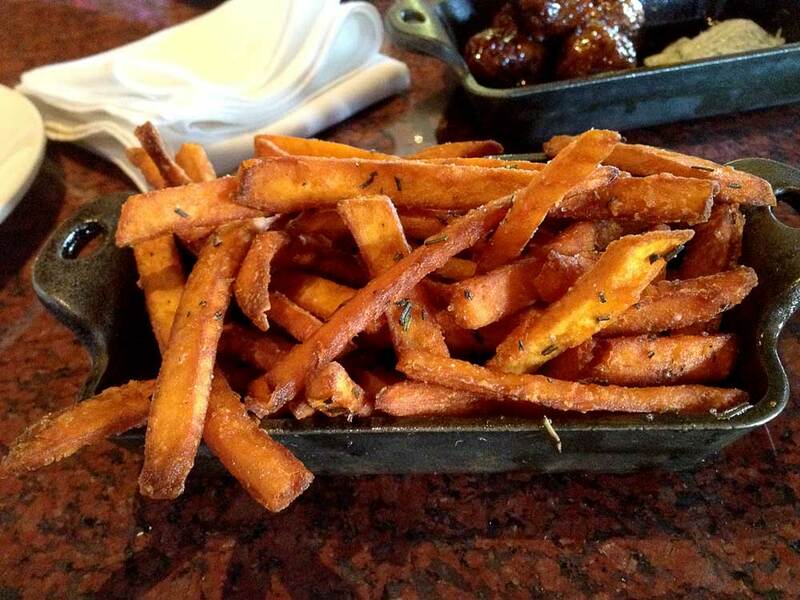 Well, I am not much of a french fry fan, but we decided to share the yam fries, nonetheless. They were delicious, but nothing to write home about… I repeat, though, I could live without eating french fries. Someone else would probably enjoy them much more than I did! Toward the end of our meal, I decided that I really wanted… no… needed another tuna tartare taco. 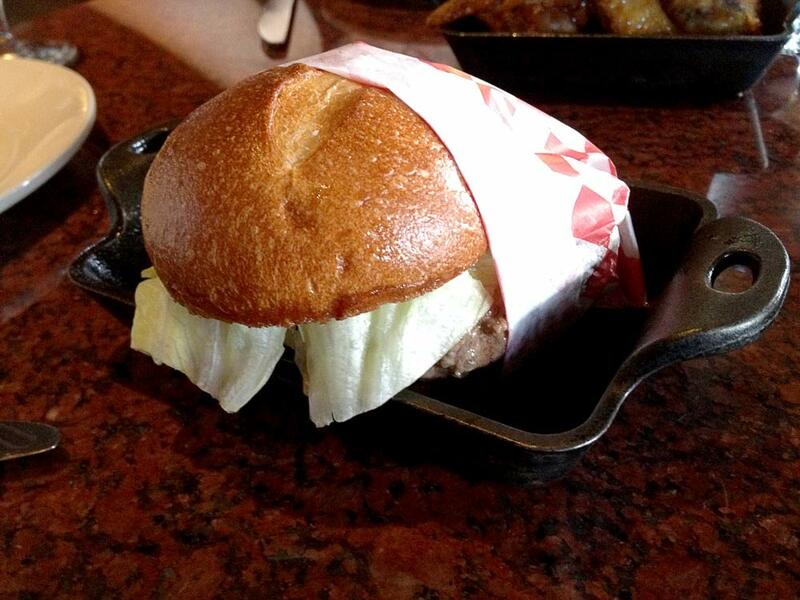 So Cindy decided her last item should be a BBQ oyster. I didn’t taste it, but she said it was delicious! And I definitely trust her opinion on seafood! Overall, this time around, I had a very pleasant and yummy experience at Stark’s Steakhouse Happy Hour. I would return every weekend if it were that easy! Head on down to Stark’s for a great happy hour! Or if you feel like going out to eat, it is a great option for lunch or dinner!